Eddie "The Other Greyhound" came by for doggie day care on a regular basis. He and Happy would race up and down the long upstairs production room. Then pass out. Sometimes people on the street would ask us where our other dog was, they got so used to seeing two of 'em. Sometimes he would stay for weeks at a time. A welcomed guest, he kept Happy amused - or at least bemused. Happy was gentle, but Eddie Booboo was the proverbial "wouldn't hurt a flea" sort of dog. Not a mean bone in his body. 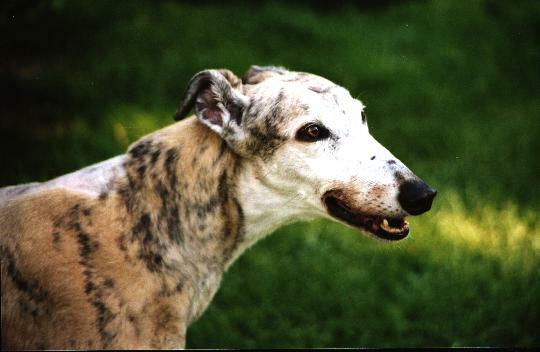 Eddie Esterberg-Hersey, Greyhound, died on July 24, 2002 after a months-long battle with bone cancer. Born "Winner's Circle Energizer" in October, 1991, Eddie joined the Esterberg-Hersey family in May of 1994. His spirit and joy for life never left him. Eddie was a loyal friend, a faithful bedside watcher whenever someone was ill, a fleet runner, an enthusiastic explorer, a companionable office mate and an expert communicator, and unfailingly careful never to nip a finger, no matter how yummy the treat it held. 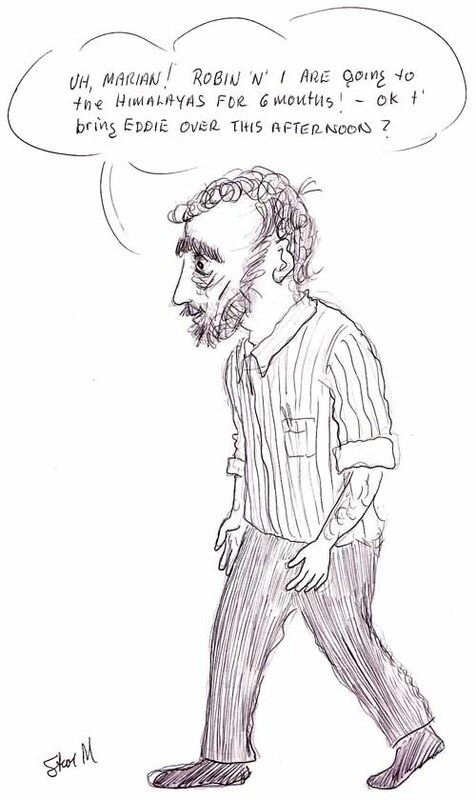 I will always remember his joyous, bounding greetings that said, "You're home! I missed you! ", and the nose-bumps under the elbow that said, "Hey, enough with the computer already! It's a glorious day, let's go for a walk!" I like to think that Eddie's spirit runs swift and sure over Elysian fields, scaring the hell out of the rabbits and squirrels (which he disdained to chase once he discovered he was both faster AND smarter), and at day's end rests at the feet of the gods, head pillowed on both front legs, ears cocked for the sound of familiar footsteps. When my time is over, if I am judged fit for no higher purpose than to hold Eddie's water bowl, I shall count my life a success. From pain and sorrow free.